Home Guidelines Teachers related JBAR /(WIFS) Program | What is Weekly Iron and Folic Acid Supplementation? JBAR /(WIFS) Program | What is Weekly Iron and Folic Acid Supplementation? What is the Weekly Iron and Folic Acid Supplementation (WIFS) Programme? The WIFS programme will also cover married adolescent girls. Pregnant and lactating adolescent girls will be given IFA supplements, according to current guidelines for antenatal and postnatal care through the existing health system of NRHM. What does the WIFS Strategy involve? Under the WIFS programme for adolescents, IFA supplements are to be distributed free on a weekly basis to the target groups in Categories A and B. In addition to IFA supplements, Albendazole tablets for de-worming are to be administered twice a year, to the same target groups. Administration of weekly iron-folic acid supplements (WIFS).One IFA tablet containing 100mg elemental iron and 500 microgram Folic acid administered on a fixed day through supervised consumption for 52 weeks in a year. Screening of target groups for moderate/severe anaemia and referring these cases to an appropriate health facility. Biannual Albendazole (400mg) for de-worming given six months apart, for control of worm infestation. Information and counseling for improving dietary intake and for taking actions for prevention of intestinal worm infestation. Anaemia is a critical public health problem in India that affects women and children throughout the lifecycle. An aemia in boys and girls limits their development, learning ability, reduces concentration in daily tasks, increases their vulnerability to infection, increases school dropout rates, reduces physical fitness and w ork productivity. Anaemia in girls during pregnancy is associated with premature births, low birth weight, and peri-natal and m aternal mortality. Adolescence is an opportune time for interventions to address anaemia, as it is an important time of growth a nd development. Missing out on nutrition education and IFA supplementation at this tim e may push young boys and girls further into the cycle of iron deficiency and anaemia. In adolescent girls, apart from meeting growth needs, sufficient iron intake is also essential before and during pregnancy. Human blood contains a red pigment called haemoglobin, which is ric h in iron. It carries oxygen to different parts of body. Deficiency of iron in diet leads to de creased amount of haemoglobin, making the blood thin and less red in colour which leads to less supply of oxygen to different parts of the body; this state is known as anaemia. If the level falls below those above, then the person is diagnosed as ha ving anaemia. There are many different types of anaemia. They could be nutritional or non -nutritional causes (heavy/chronic bleeding, infections, genetic disorders or cancers).Nutritional anaemia, particularly, is the most widely prevalent form of anaemia in the country. Poor Dietary intake of iron resulting in deficiency of iron in the body and thus Iron deficiency anaemia (less intake of iron rich foods; Gender discrimination in food allocation in a family aggravates the situation. Low bio-availability of iron- Habitual intake of cereal based diet high in phytate and poor consumption of iron absorption enhancers such as vitamin C result in low availability of iron. Dietary deficiency of vitamins such as Folic Acid, Vitamin C, Vitamin B12. Accelerated increase in requirement for iron during adolescent period. Loss of blood in case of heavy menstrual bleeding. Teenage marriage and early pregnancy – Teenage pregnancy places double burden on the physically and physiologically immature body of girls and results in increasing the likelihood of anaemia, maternal mortality, pregnancy complications and birth of low birth weight babies. Iron deficiency anaemia develops after normal stores of iron have been depleted in the body. Thus the signs of anaemia may not be clinically visible until the anaemia is severe (Hb less than 7-8 gms/dl).1 However, adverse impact on health occurs even before this stage is reached. 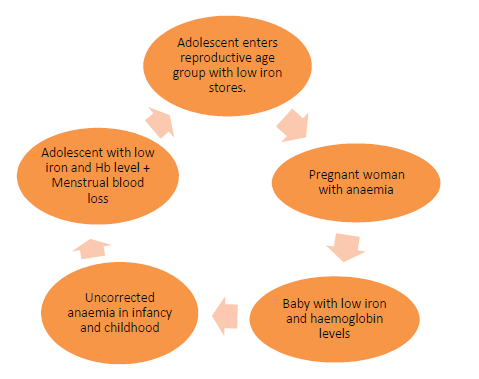 The high risk groups for anaemia include- Women of child bearing age who have blood loss through menstruation Pregnant and lactating women who have an increased requirement of iron Adolescents and children who have rapid growth phases People with poor dietary intake of iron through a deficient diet. Whiteness or pallor in the inner rims of the eyelid, tongue, overall skin, nails, palms of the hand. Soreness of the mouth, with cracks at the corners. Dizziness, tiredness, fatigue and low energy. Unusually rapid heartbeat, particularly with exercise. Shortness of breath and frequent headaches, particularly with exercise. Lack of interest in play and studies. 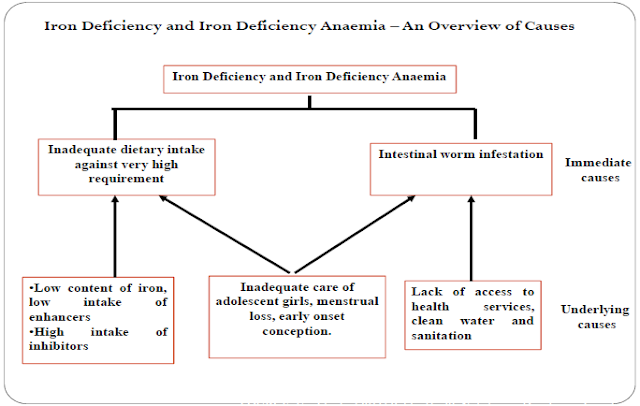 Iron deficiency anemia develops after normal stores of iron have been depleted in the body. Thus the signs of anemia may not be clinically visible until the anemia is severe (Hb less than 7-8 gms/dl).2 However, adverse impact on health occurs even before this stage is reached. Pallor of tongue, nail, conjunctiva (lower eyelids) of eyes, fatigue, weakness, dizziness, drowsiness,loss of appetite and swelling (odema) of feet. If an adolescent looks pale, fatigued or listless and anemia is suspected, refer her/him to the nearest PHC. Primary prevention of anaemia is achieved through well- balanced diet rich in iron and other vitamins and minerals involved in iron absorption or in the production of RBCs/Haemoglobin. Adolescence is a significant period for physical growth Adolescents need to eat a balanced diet i.e. adiet that (carbohydrates, proteins, fats, vitamins and minerals) in proportions for maintaining health and general well-being. Eating a balanced diet means consuming different types of food items like pulses, chapatti or rice, green vegetables, locally available fruits and milk every day. Proteins are required for body building and help in repair and maintenance of body tissues. Egg, milk, pulses, fish, meat, ground nut are some examples of body building foods. Fats are high-energy foods and provide fat-soluble vitamins. Oil, ghee, butter, cheese, egg, fat of meat, fish, ground nut oil, and mustard oil are some examples of fat. Carbohydrates form the major component of most diets and are the main source of energy. Rice, potato, sugar, banana, jaggery, sugarcane, honey are the examples. Vitamins and minerals are required in small quantities. They play an important role in growth, repair and regulation of vital body functions. Fruits and vegetables are the examples of protective food. Calcium needs during adolescence is greater in adolescence because of rapid increase in lean body mass and skeletal growth. Milk and milk products are rich source of calcium. (i) Green vegetables and fruits. (ii) Grains-wheat, jowar, bajra, sprouted pulses, ground nut, sesame, jaggery, dried fruits. (iv) Vitamin C rich foods help in absorption of iron. Citrus fruits (oranges, lemon), Indian gooseberry (Amla), apple, pear are rich in vitamin C.
However given that many of these sources of iron are often not available on a regular basis to most people in our country, eating green vegetables should be emphasized. This is more likely to be widely available even among families with low incomes. It should certainly be part of the meals served in schools and at the Anganwadi Centers. In our Indian diets, the absorption of iron from the diet is poor because of the presence of certain chemical substances. For example tannin in tea can hamper the absorption of iron. On the other hand vitamin C and vitamin C rich foods like amla (Indian gooseberry, lime juice, oranges, and sprouts improve iron absorption. Thus tea, coffee or soda containing drinks should not be consumed immediately before or at least two hours after a meal. Adding Vitamin C rich foods to the meal should be encouraged. Prevention of malaria: Clean surroundings, use of insecticide treated mosquito net while sleeping helps keep malaria mosquitoes away from people and greatly reduces malaria. Prevention and treatment of hookworm infestation: Deworming reduces worm load and blood loss and prevents anemia. To prevent hookworm infestation one should maintain personal hygiene and environmental cleanliness. One should use latrine and avoid open air defecation. Regular consumption of Albendazole 400mg tablet, six months apart, for control of helminthes infestation should be undertaken. Personal hygiene and sanitation, food hygiene Use of clean drinking water can help protect from various infections and diseases. Washing hands with soap water before cooking, consuming food, after defecation and after discarding faecal matter of a child is essential to prevent entry of germs into our abdomen Keeping personal hygiene Preparing and consuming hygienically treated or prepared food . Yellowness of tongue, nail, palm and conjunctiva of eye. Fatigue and loss of appetite. If anaemia is suspected it is important to refer the adolescent girl/boy to the nearest health facility for further examination.